Look for these summer fruits and vegetables at farmers markets and in produce departments for the best flavor (and greatest value)when they're in season. Specific crops and harvest dates will depend on your region's climate-see Seasons by Region and Seasons by State for more details. For more fruits and vegetables, see this Year-round Seasonality Guide. Or, jump right to 10 Sweet Summer Fruits or 10 Great Summer Vegetables to get your mouth watering. Apples come into season mid- to late-summer and are harvested into fall in most apple-growing regions. Look for different varieties from growers near you. Apricots are harvested starting in late spring in warmer areas and through early summer. The most flavorful apricots neither travel nor keep well, so look for them at farmers markets. Avocados have a season that defies logic - they are fickle depending on their exact location. Most, however, are in season over the summer. Ripen hard avocados on the counter or speed things up by keeping them in a paper bag. Basil grows alongside tomatoes very well (in the garden and on the plate). Look for unblemished, leafy branches without flowers or buds (the herb gets a slightly bitter aftertaste once it flowers which is part of the reason growers pinch off the buds before they can flower). Bell Peppers should have smooth, shiny skins (whether they are green, red, orange, yellow, or purple) and feel heavy for their size. Beets are often sold with their green still attached when they are freshly harvested - giving you a two-for-one. Cook the greens as you would chard or other cooking greens. Blackberries should be shiny and plump. Avoid any berries with mushy or moldy berries - these damages rot and spread fast. Rinse berries only just before eating or using them, never in advance, since they will become soggy and rot faster. Blueberries are the only berries that have a dull, matte finish to them when ripe. Cantaloupes that feel heavy for their size and that smell like melons are the ones to buy. Slice 'em, cube 'em, eat 'em up. Carrots are harvested year-round in temperate areas. Unusual varieties are harvested during the carrot's natural season, which is late summer and fall. True baby carrots - not the milled down versions of regular carrots sold as "baby carrots" in bags at grocery stores - are available in the spring and early summer. Chickpeas (a.k.a. garbanzo beans) are sometimes available fresh at farmers markets in warmer climates. Look for small pale green pods still attached to twisted, twirling vines. Chiles (a.k.a. hot peppers or hot chiles) need heat to ripen and get hot - look for them at the end of summer and into early fall. Collard Greens, like most leafy green plants, bolts (flowers) and turns bitter when it gets hot enough, so it hot climates it is in season all year except summer, everywhere else summer is the time to look for it. Corn is best the minute it is picked from the stalk, so it is a food to look for from local growers for sure. You want tightly closed, fresh-looking husks, fresh-looking tassels, and fresh-cut stem-ends. Know that organically grown corn is very likely to have a worm or two in any batch - simply pick it out, the rest of the corn is fine to eat. Cucumbers are known for being cool - as much as 20 degrees cooler than the outside temperature. Lucky for us that they come into season in most areas just as the summer heat kicks in. Edible Flowers add color and delicate flavors to salads. Eggplant should have shiny, tight, smooth skin and feel heavy for its size, no matter which variety. Fennel bolts in hot weather, but is in season in cooler climates in the summer (look for it fall through spring in temperate and warmers areas). Figs have two seasons, but the main one is during mid- to late-summer (a second shorter season comes in November in warm climates). Gooseberries are green when ripe with a wonderful tart flavor. They should be plump and fresh-looking. Grapes of all varieties ripen towards the end of summer where they grow best; the harvest continues into fall. Green Onions should have fresh, green tops and firm, slime-free white bottoms (fresh-looking, pale roots still attached to the whites are a good sign, too). Herbs of all sorts grow through the summer - from basil to rosemary. Always looks for vibrant leaves and fresh-looking stems.You can always dry any extra! Huckleberries are a true treat of summer in areas lucky enough to have them (Pacific Northwest, are your ears burning?). Look for plump, purple berries. Lemongrass has a heavenly lemon-esque aroma that includes a whiff of ginger and the heady scent of tropical flowers. While it can be delicious with most anything, lemongrass is particularly delicious with chicken and seafood. Think of it as a perfume for your food. Lettuce is in season in cooler climates (and out of season in warmer ones). Know that lettuce bought at farmers markets will last much longer than store-bought. Limes are the only citrus at their best in summer. Look for small, heavy-for-their-size fruits. Mangos need tropical heat to ripen and come into their sweet best in late spring and summer in Florida and Hawaii. Marionberries are a type of blackberry. Look for plump, shiny berries with a deep purple hue. Nectarines are, essentially, fuzz-less peaches. They should feel heavy for their size and give just a bit when held firmly. New Potatoes are small, freshly harvested potatoes with paper-thin skins. They are delicious simply boiled and buttered or used in potato salads. Okra needs heat to grow, so a nice long, hot summer in warmer climates brings out its best. Look for firm, plump pods. Onions come from storage all year round but most onions are harvested in late summer through the fall. 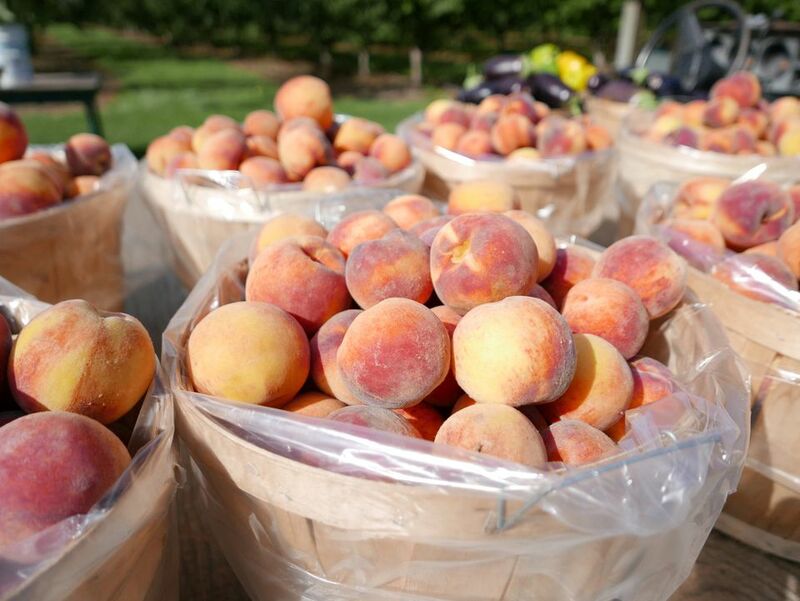 Peaches are one of the highlights of summer eating. Look for fruits that feel heavy for their size and that give just a bit when pushed. Avoid fruits that have green near the stem. Pears start being harvested in summer in many climates. Peas come into season in the spring and continue in most areas well into summer. Plums & Pluots should feel heavy for their size and have a lovely, perfumed and sweet smell. Radicchio is sweeter when it doesn't get too hot. Radicchio comes into season in summer in cooler climates. Look for somewhat firm heads, a fresh-cut end, and bright white ribs on the pretty purple leaves. Radishes should have bright, fresh greens attached (that tells you they are freshly harvested). Raspberries are the most delicate of all berries. Look for plump berries and never buy a carton (or flat) with smashed, rotting, or moldy berries - that damage spreads incredibly fast. If they seem at all starting to fade, freeze them! They'll be great in smoothies and any recipe that cooks them. Rhubarb is the first fruit of spring in many areas but stays in season into summer in most areas - look for heavy stalks with shiny skin. Shallots are milder, sweeter, and less bitter than their onion and garlic cousins—perfect for salad dressings. Shelling Beans are those beans that can become dried beans but are briefly available fresh, as shelling beans, in mid-summer to early fall depending on your climate. Spinach, indeed, has a season. It varies with your climate - year-round in temperate areas, summer and fall in cooler areas, fall through spring in warmers regions. Use it in salads or simple sautees. Strawberries are mostly grown in California or Florida, where the strawberry growing season runs from January through November. Peak season is April through June. Other areas of the country have shorter growing seasons that range from five months to as short as a few weeks in the coldest areas where you'll find local specimens at markets in July. Sunchokes/Jerusalem Artichokes have a pale brown, dull exterior and a delicately nutty flavor. If you're not sure what to use them in, try this simple gratin. Sweet Peas have slightly different seasons depending on type and region, but they are generally available in spring and summer. Tomatillos look like small green tomatoes with a light green papery husk. Tomatoes may be the single number-one draw to farmers markets and local eating. Try to sample tomatoes before you buy them - even beautiful, heavy, unblemished specimens can lack the flavor you want. Zucchini & Summer Squash have a harvest season from summer into fall in most climates. Find great zucchini recipes here if you're overwhelmed by the bounty. Zucchini Blossoms are increasingly sold at farmers markets and specialty stores. Look for fresh blossoms (no brown ends or tips) and use them quickly.